The perfect way to use leftover chicken. In a small bowl, combine black beans and lime juice. Mash until almost smooth. Stir in red onions and cilantro. Reserve. Place ciabatta rolls in oven. Toast for 5 minutes or until light golden brown. Spread one side of ciabatta with half the avocado, chicken and lettuce. Spread the other half with half of the bean mixture and season to taste with salt. Place on top to make a sandwich. Repeat with remaining ingredients. 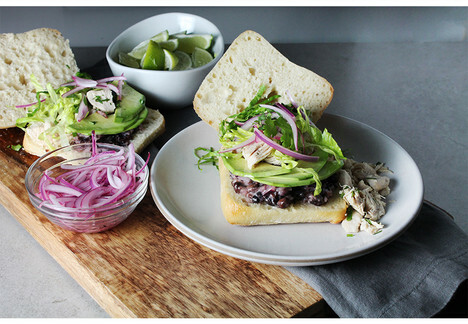 Tip: Add any leftover jalapeno relish to torta for extra flavor!